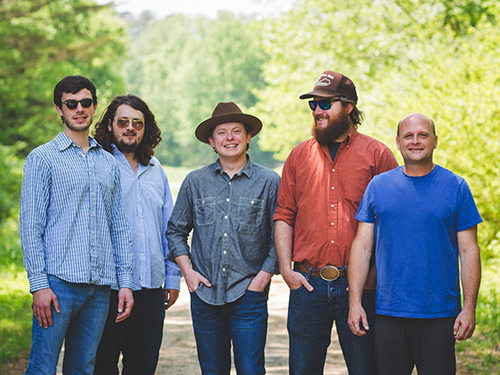 Energetically honoring the sound of traditional bluegrass and mountain music, with threads of singer-songwriter, rock, and jam band music woven throughout, The Wooks are as at home on a festival stage as they are in a barn in the heart of Kentucky’s horse country. The Wooks: Aaron Bibelhauser (Banjo), CJ Cain (Lead Guitar), Arthur Hancock (Guitar), Roddy Puckett (Bass), were born over some 20 years time somewhere between an Irish pub, an IBMA Songwriter Showcase, and a festival jam circle. Inspired by legends and trailblazers like Crowe, Whitley, Simpson, Bush, Stapleton, and Rice who cut their teeth on stages throughout the Bluegrass Region, The Wooks translate the sights and sounds of the people, hills, bars, roads, and creeks around them into songs and shows that captivate. With both respect for their heritage and innovative originality, The Wooks are the natural evolution of a sound that has always been there.